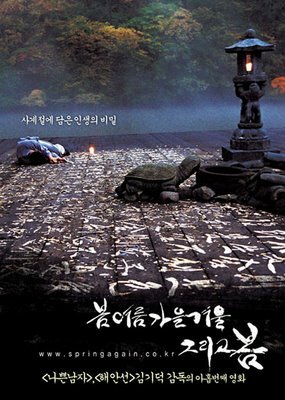 Released as Spring, Summer, Fall, Winter… and Spring, this 2003 South Korean movie effortlessly slides into my list of the best I have seen. If you are looking to see a movie that is calming and profound, one which will leave you in a meditative mood, this is the title to watch. Shot entirely on a floating house in the middle of a lake and the surrounding mountains, the visuals are stunning and add to the mood. So is the music. The script is so minimal, I think it will fit in 2-3 pages at most. The story moves fluidly, not requiring any dialogues to convey its message. Five minutes into the film and you know this is going to be different. Abundant moments of complete absence of background score and no human sounds, just the natural creaking of a door, the splash of water, and rustle of leaves. Very melodious. The title represents the many stages in a person’s life. Written and directed by Ki-duk Kim, this is entirely his story. The actors (including the director) do a fine job but the movie is not built on their shoulders; it stands on its own. As one gentle surprise after another is served I was left wondering that the true surprise is one which quickly retreats giving you space and time to ponder on its message. This movie is generously endowed with such moments. Bom yeoreum gaeul gyeoul geurigo bom is about Zen, Poetry, Calm, Politeness, Guilt, Remorse, Sensuality, Innocence, Lust, Murder, Repentence, Meditation, Anger, Wisdom, a cat’s whiskers, and its tail, Punishment, Therapy, Learning, and Love. The poster is courtesy this website, where you can also find a more elaborate review. The IMDB page is here. The Wikipedia page is here.